Now that you have all of your Eventbrite registrations pages up and ready to take live, it’s now time to start building out the actual integration and the different elements within it that will help you better automate a number of the different areas of the event process. As I’ve said before, I’m not here to tell you how to integrate the two platforms. If you want to know how to do that, read through this HubSpot article. It’s very helpful and the process is relatively straight forward. Once you’ve integrated the two platforms, it’s time to start connecting a few dots to make sure that all of the necessary information is not only being shared between Eventbrite and HubSpot but it’s getting stored in the right place. Below is a list of different items that you should check off your list once you’ve integrated the two platforms and before you begin promoting your registration pages. One of the best things about HubSpot is that it provides you the opportunity to not only createdintegrated digital marketing campaigns but also track them through its Campaigns tool. 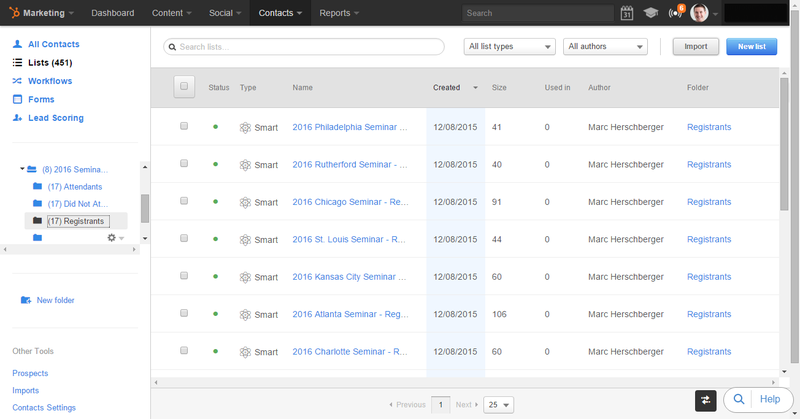 You will want to create a campaign inside of HubSpot for your event(s) and connected everything else listed below to this campaign so you can see successes and failures in your promotion and execution in one easy to reach place. While general contact information is shared between Eventbrite forms submissions and HubSpot contact fields, custom Eventbrite form fields do not map over to HubSpot through the native integration. Fortunately though, you can use Zapier to map these form fields over and store the information inside of HubSpot. This will mean that you will need to create new form fields inside of HubSpot to connect the two applications if you didn’t already have them created. Event-Specific Registrants – This is a list created for each event, helping track the people who registered for that specific event. It is set up to pull the “Eventbrite Registration Property” and connects the two platforms through the event’s name (you will need to type in the event name exactly as it is laid out in Eventbrite). Event-Specific Attendees – This is a list created for each event, helping track the people who attended that specific event. It is set up to pull the Eventbrite Attendance Property” and connect the two platforms through the event’s name (you will need to type in the event name exactly as it is laid out in Eventbrite). Event-Specific No Shows – This is a list create for each event, helping track the people who registered but did not attend a specific event. It is set up to pull a list of people in HubSpot who are a member of the Event-Specific Registrants list but not a member of the Event-Specific Attendees list. Until the event is complete, this list will be the same size as the registrant list. All Registrants – This is a list that tracks all of the registrants for your entire event series (if you have multiple events). It is made up of anyone who is a member of any of the event-specific registrants lists. All Attendees – This is a list that tracks all of the attendees for your entire event series (if you have multiple events). It is made up of anyone who is a member of any of the event-specific attendees lists. All No Shows – This is a list that tracks all of the people who registered but did not attend the event series (if you have multiple events). It is made up of anyone who is a member of any of the event-specific no show lists. 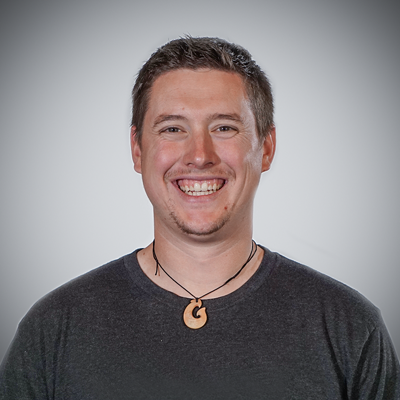 New Leads From Eventbrite – This is a list that tracks any new contacts who were generated from Eventbrite that weren’t already contacts inside of HubSpot. Because all registrants submit their information through Eventbrite and not HubSpot and their new HubSpot profiles come in as “subscribers” in their lifecycle stage instead of “lead”, there is no easy way for HubSpot to automatically track new leads generated from your event. This list pulls anyone with a “Lifecycle Stage” set as “subscriber” and their “Original Source Data 1” contact property set as “INTEGRATIONS_PLATFORM” showing that they are new HubSpot contacts and that they came in through your HubSpot-Eventbrite integration. This list can be used to count new leads for an event vs. current leads and can be used in a workflow to change their lifecycle stage to “Lead” if your marketing requires it. Follow-Up Workflows – You can set up a HubSpot workflow to automatically send reminder and follow-up emails to your registrants to both ensure that they remember to attend your event as well as move further down the marketing/sales funnels once the event is over. These workflows can be set up either using your lists from above or Eventbrite properties and timestamps to connect the dots between specific events, the contact’s attendance and the type of emails they receive. Lifecycle Stage Change Workflow – As stated in the last list above, you may want to track all of the new contacts created by Eventbrite as “Leads” instead of “Subscribers”. If that’s the case, you’ll need to use the list and this workflow to facilitate that change. Internal Notification Workflows – Depending on who your event is targeting, what you’re pushing for as a next step, specific actions connected to those events that signify something to you and your sales team or literally a million other things, you may want to use a workflow to track these different things and notify the proper people so that you can take advantage of that information. If your event covers a number of different items that you don’t want your competitors to see by registering, you may want to create a workflow that sends you and email whenever a contact connected to your registrants list has an email domain that matches a list of your competitors. If your follow-up procedure includes a survey that provides incentives for completing it, you may want to create a workflow that notifies you once a survey is completed so that you can send them their prize. 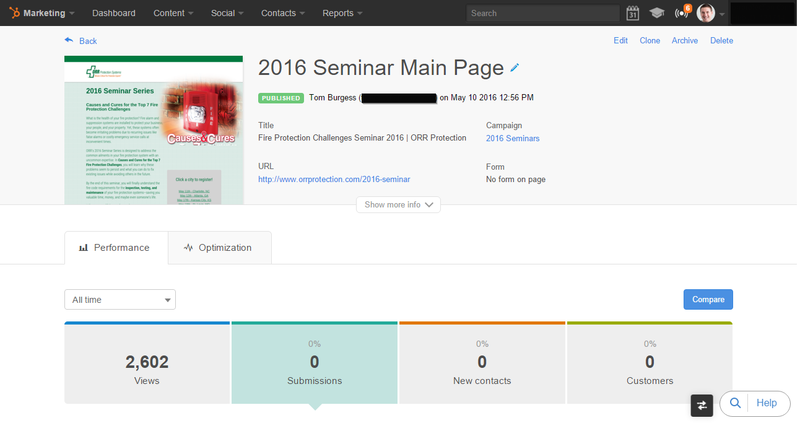 Event Splash Page – More likely than not, you’ll want to create a page on your own website that acts as the focal point of your entire promotion strategy, housing the overall event description and links to your registration pages. 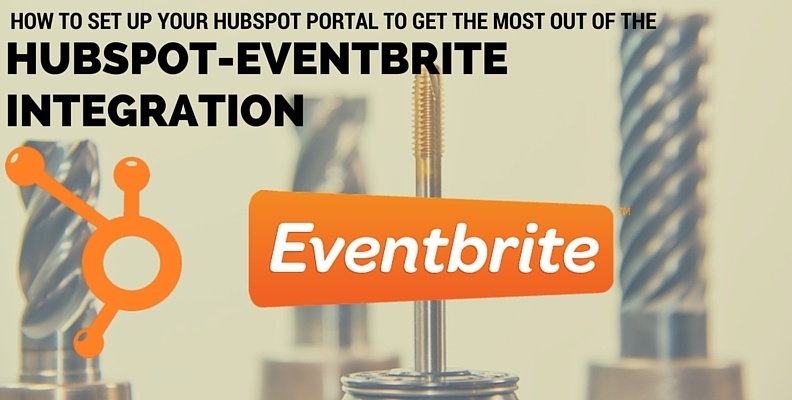 If you plan to embed your Eventbrite registration pages on your website, you’ll want to use your HubSpot tracking links to connect the two pages. If you plan to link to the actual Eventbrite pages, you’ll want to use your Eventbrite tracking links. The same linking processes goes for HubSppot CTA’s. Event iframe Pages – If you decide to embed your Eventbrite registration pages on your website, you’ll need to create a simple page design that allows you to do so. Keep the design similar to the splash page’s design, include a header to easily showcase which event this page is promoting and then use the rest of the space (full page width) to embed your registration page. You may consider including a form or contact information for people to use if they run into problems or have a question. 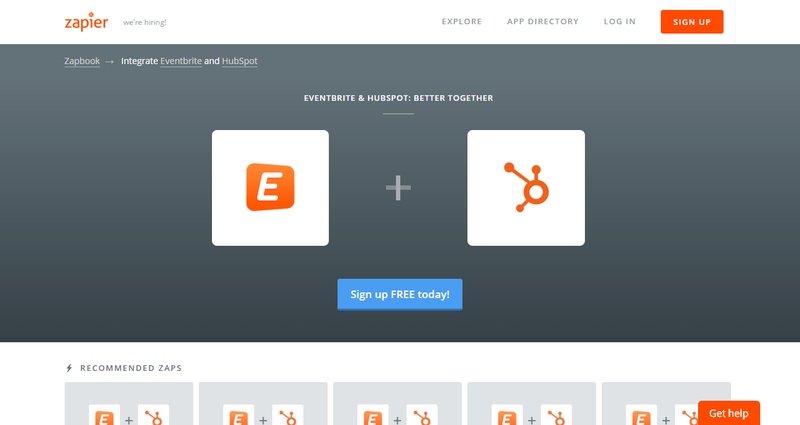 Properly setting up both your Eventbrite and HubSpot accounts/portals for the integration is probably the most important part when it comes to getting the most out of the connection between the two. Without that set-up, you’re left with a basic integration that gets some of the information you may want but not everything. So once you have all of your backend set-up complete and your integration done, it’s time to turn your attention to the tracking and reporting of your campaign that will use the information collected through the integration. If you have any questions regarding any areas of the series laid out, please feel free to leave a comment in the sections below or email me directly at mherschberger@revriv.com. We Swapped Agency Employees for a Day. Here's What We Learned.